5 minutes from the famous hippy market ´Las Dalias ´in San Carlos. 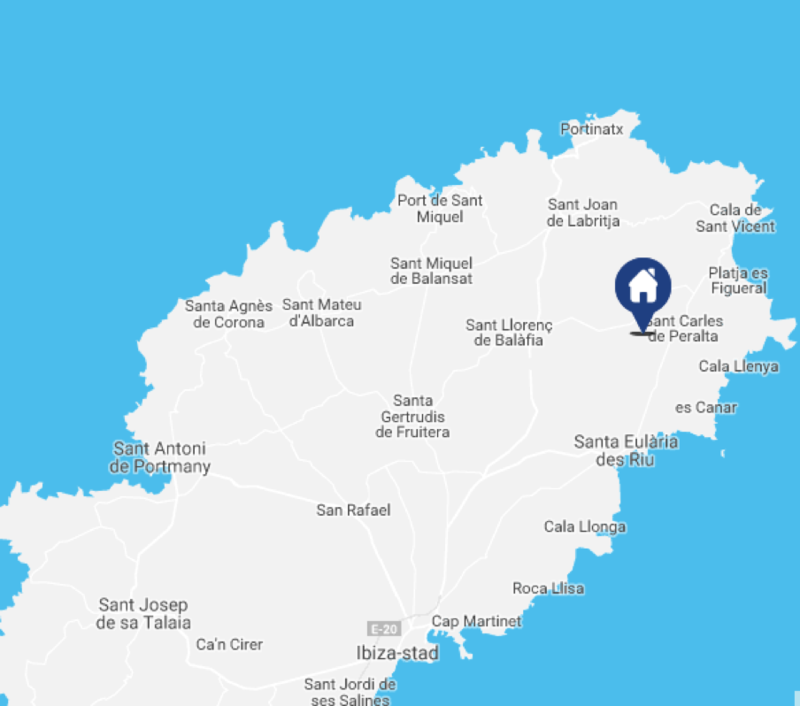 The house is located in the northern part of Ibiza, near the town of San Carlos on 80,000m² grounds, set in harmony with nature and with all modern amenities. The many beaches of the Northeast are nearby, just 10 minutes. It is also near the famous hippie Markt ’Las Dalias’ in San Carlos. Built 300 years ago, this gem has been completely renovated by its owner. Maintaining its wooden Sabena beams and charming structure, decorated with carefully purchased pieces from the various markets in Ibiza. As you enter the villa from the main road, leading you to stables on this private plot directly onto vast land with orchards and small villa where the house manager lives. He is available to assist with everything guests may need, like breakfast, extra cleaning, maintenance, etc. at a small fee. Step into the villa and into the lounge / living room with high ceilings, where you have two sofas, TV and fireplace. On the same floor you have a separate dining room with large dining table and direct access to the garden and pool. The kitchen is large with all modern appliances, fully equipped for cooking and serving 14 guests. The main house has 5 bedrooms and 4 bathrooms. All rooms are double rooms, equipped with air conditioning. Bedroom 1 is located on the ground floor next to the living room and bedrooms 2 on top of it, both have their own bathroom with toilet and shower. Bedrooms 3, 4 and 5 are on the first floor. Here you also have a second living room with 2 large sofas, TV and terraces with access to the pool area. Bedroom 3 has a private bathroom. Bedrooms 4 and 5 shares a bathroom, which is located just between the rooms. The guesthouse offers 2 extra bedrooms, both with their own bathroom. There is also a livingroom and open kitchen. The villa has an outdoor area with a large barbecue, kitchen and water supply to the pool area with views. A wooden table for 14 guests make this area ideal for dining during the warm summer months. There is a private pool with sun loungers, a 4-poster bed and a garden Bali. Around the villa are several living areas and terraces.